Yesterday was incredibly humid and my brain just kind of goes to mush. I had all kinds of intentions but I was just looking at things then moving them around on my table, which of course is my kitchen table that never gets eaten on. Anyways, after the cool air moved in and pushed the humidity out my brain became enlightened. I bought this 3-D sheet of sunflowers a while back, some sheets come precut but of course I bought the one that you had to cut. So I just took my time and each layer I cut with my smaller scissors and just put this very simple card together, layering each with thos adhesive foam squares that add dimension to these kinds of designs. A friend of mine Becky loves sunflowers and if you could say what flower is that person? I would say, Becky is. She smiles all the time and has the biggest eyes and hair to match, but, she is a very kind and generous person. 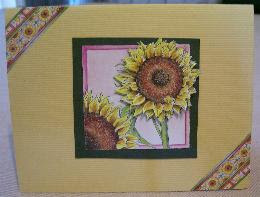 She just glows like sunshine...so Becky if you read my post today this card I made thinking of you. The sentiment inside is stamped in Tim Holtz Distress Ink and reads Thinking of You.